A 39-foot (12 meter) diameter impact crater formed between Oct. 25, 2012, and April 21, 2013, and was discovered in a before-and-after image created from two Narrow Angle Camera (NAC) images. The image covers an area 1,200 m wide. New craters are forming on the surface of the moon more frequently than scientists had predicted, a new study has found. The discovery raises concerns about future moon missions, which may face an increased risk of being hit by falling space rocks. The moon is dotted with a vast number of craters, some billions of years old. Because the moon has no atmosphere, falling space rocks don't burn up like they do on Earth, which leaves the moon's surface vulnerable to a constant stream of cosmic impacts that gradually churn the top layer of material on its surface. You can see a before-and-after video of a new moon crater here. An animation using two before and after images reveals the appearance of a new 39-foot-wide (12 meter) crater on the surface of the moon. To find out more about the present lunar crater formation rate, a group of scientists analyzed more than 14,000 pairs of before-and-after images of the moon's surface, taken by NASA's Lunar Reconnaissance Orbiter (LRO). These images covered 6.6 percent of the lunar surface — about 960,000 square miles (2.49 million square kilometers) — and could reveal when a spot was crater-free and when it later had a crater. The time gaps between observations spanned between 176 and 1,241 Earth days. "When looking at just a single image, many of the newly formed features are indistinguishable from their surroundings," said study lead author Emerson Speyerer, a planetary scientist at the Arizona State University at Tempe. "It's only with these detailed comparisons with previous images that we can separate out these small surface changes. This lunar map shows the locations of new impact craters (yellow dots), which were discovered by analyzing 14,000 before-and-after images of the lunar surface. The two red dots mark the location of the March 17, 2013, and the Sept. 11, 2013, impacts that were recorded by Earth-based video monitoring. The researchers discovered 222 craters on the moon that appeared on the surface after the first LRO images were taken — that is 33 percent more than predicted by current models. These were at least 32 feet (10 meters) across, and ranged up to about 140 feet (43 m) wide. The scientists also found broad zones around these new craters that they interpreted as the remains of jets of debris following impacts. They estimated this secondary cratering process is churning the top 0.8 inches (2 centimeters) of lunar dirt, or regolith, across the entire lunar surface more than 100 times faster than thought. "I'm excited by the fact that we can see the regolith evolve and churn — a process that was believed to take hundreds of thousands to millions of years to occur — in images acquired over the past several years," Speyerer told Space.com. These new findings also suggest that a number of young features on the moon's surface, such as recent volcanic deposits, "may in fact be even a bit younger than previously thought," Speyerer said. Although the odds of something on the lunar surface suffering a direct hit by asteroidal or cometary debris is very small, Speyerer noted these new findings illustrate the potential dangers posed by the rocks kicked up by these impacts. 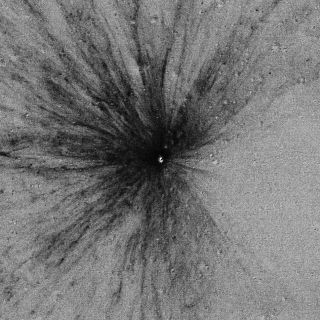 "For example, we found an 18-meter (59-foot) impact crater that formed on March 17, 2013, and it produced over 250 secondary impacts, some of which were at least 30 kilometers (18.6 miles) away," Speyerer said. "Future lunar bases and surface assets will have to be designed to withstand up to 500 meter per second (1,120 mph) impacts of small particles." The top image shows a low-reflectance splotch, while the bottom image shows a high-reflectance splotch that was created by a small impactor or secondary ejecta from a larger impact. In either case, the top few centimeters of the regolith (soil) was churned. Speyerer said that NASA recently approved a two-year extended mission for the Lunar Reconnaissance Orbiter that can help collect more before-and-after images of the lunar surface. "As the mission continues, the odds increase of finding larger impacts that occur more infrequently on the moon," Speyerer said. "Such discoveries will enable us to further refine the impact rate and investigate the most important process that shapes planetary bodies across the solar system." The scientists detailed their findings online in today’s (Oct. 12) issue of Nature. Follow Charles Q. Choi on Twitter @cqchoi. Follow us @Spacedotcom, Facebookand Google+. Original story on Space.com.